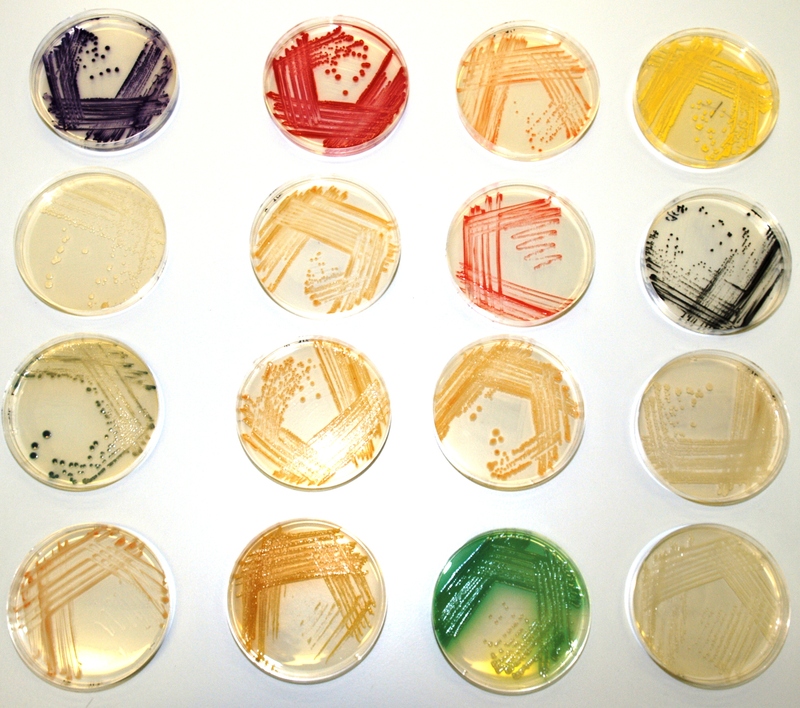 C-MOULD, the world’s largest collection of microorganisms for use in the arts, with over 50 different kinds of microorganism. We have bacteria and fungi that glow in ethereal shades of green and blue light, bacteria that make gold and electrically conductive nanowires, and bacteria that produce biotextiles. We also possess the largest collection of pigmented bacteria. Here is the palette of living colours that is available through C-MOULD. Behind the obvious colour, each bacterium has its own unique personality and history (see below) and when used in paintings each one adds it own character to the work. Pseudomonas aeruginosa (green)This bacterium has a split personality. It is very common in soil and is able to live a blameless life here. However, if it is provided with opportunities (such as failings in the host’s anti-infective defence) it will cause disease in most living things, including humans, and accordingly it has been described Nature’s pre-eminent universal pathogen. Chromobacterium violaceum (purple) Very common in soils from tropical and subtropical regions, it produces a purple pigment which also has powerful antiviral and anticancer activities. Bacillus atrophaeus (brown) A common soil bacterium which is often used as a harmless surrogate for the bacterium which causes anthrax. Has the ability to form a tough resting body called an endospore. Serratia marcescens (red) This distinctive red pigmented bacterium has been evoked as a natural explanation of the “miraculous” appearance of blood at various times throughout history. Vogesella indigofera (blue) A rare blue and gold pigmented bacterium that was isolated from the sediment of a pond that was used for the disposal of highly toxic chemical wastes for 20 years. Staphylococcus epidermidis (white) One of the most frequent bacteria that is found on human skin. In most cases it is not considered to be harmful but it is also recognised as major cause of nosocomial (hospital-acquired) infections particulary in immunocompromised patients. It is highly resistant to many antibiotics including penicillins. Bacillus subtilis (orange) Common in soil and has the ability to form a tough resting body called an endospore. In the past its powerful enzymes, that digest proteins, were incorporated into biological washing powders that cleaned “whiter than white”. Inhalation of such products, particularly amongst factory workers involved in their preparation, has been shown to cause asthma. The organism has also become widely adopted as a model organism for laboratory studies. Science and art meld to create a fantastic palette of living paints – extraordinary work by Dr simon Park. Are these available for order anywhere? I’d be very interested. I am in my final year of Product Design and Manufacture (BEng) at the University of Nottingham, UK. My project currently is about designing a product to benefit and create awareness of the human microbiome. I am interested in using bacterial paint. Would you be able to help me with my research? Thanks for your interest in my work. I’d be happy to help via phone or email. That would be great,my email address is laycd1@nottingham.ac.uk. I unfortunately cannot find yours, so please email me first. Your work is absolutely amazing and exactly what I am looking for. I am a biotechnology student of D Y Patil University, Mumbai. I am currently researching to find pigmented bacteria from environment especially the prominent ones like Chromobacterium violaceum (purple) and Serratia marcescens (red). Can you please help me with proper isolation protocol for the same.